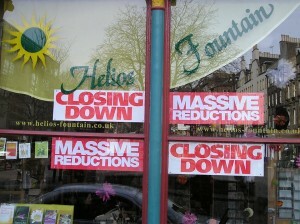 My old neighbour in the Grassmarket Jos at Helios fountain has today announced that the shop will be closing. A fountain of knowledge with over 30 years in the Grassmarket Jos was always very good to me and though I’ve known the news for quite some time it is still sad now the news is finally public. I would urge everybody to pay one last visit and support their closing down sale. It is of course a massive blow to the Grassmarket’s footfall but you will be relieved to know that at least there will not be a second tartan tat shop appearing. I can’t say just yet who will be moving in but some of you will be very excited indeed. There will not I should stress be an Avalanche comeback ! Again many thanks and my best wishes to Jos and all the staff I got to know so well.